What to expect from May and June tornado season? After suffering one of the worst tornado outbreaks in recorded history, and what is likely to be a record-setting April for tornadoes, the U.S. will be in an extremely vulnerable state as we head through the more notorious severe weather months of May and June. The average number of tornadoes (based on the past three years) in May is 322, while the average for June is 296, according to the Storm Prediction Center. 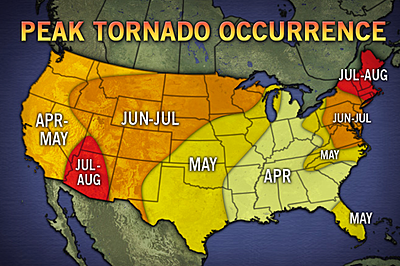 Both of these months are typically the two most active of the year for tornadoes. 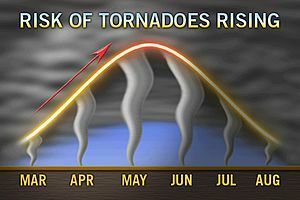 The question many people are asking now is how bad will May and June be this year, especially after such an extreme April that has yielded more than 1,000 reports of tornadoes. With abnormally cold air still in place across the northern tier of the U.S., there will still be opportunities for that cold air to contrast with substantially warmer air across the South, resulting in severe weather and tornado outbreaks. While there could still be several more tornado outbreaks over the next few months, the odds of having another extreme outbreak like Wednesday's is highly unlikely. Years in which April was an unusually active month for tornadoes typically were not followed by well-above-normal activity in May and June. Tornadoes are a rare phenomena and require the right ingredients to come together in order to form. The weather pattern that has been allowing these ingredients to come together in April typically isn't conducive to well-above-normal tornado activity in May and June. As spring progresses, the threat for severe weather and tornadoes tends to shift northward and eastward across the Plains and East, as the jet stream, an area of maximum winds high up in the atmosphere, shifts northward.